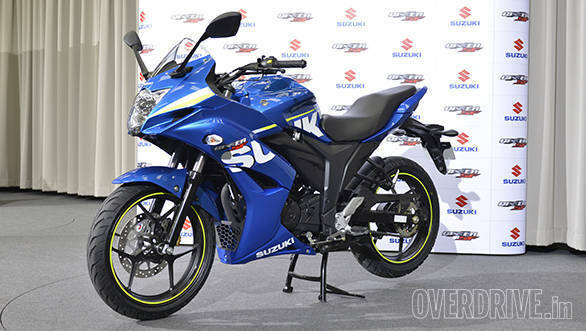 Meet the new Suzuki Gixxer SF. The SF, or Sport Fairing, is the new model based on the excellent Suzuki Gixxer that adds a fairing to the motorcycle and creates a sportier looking package. 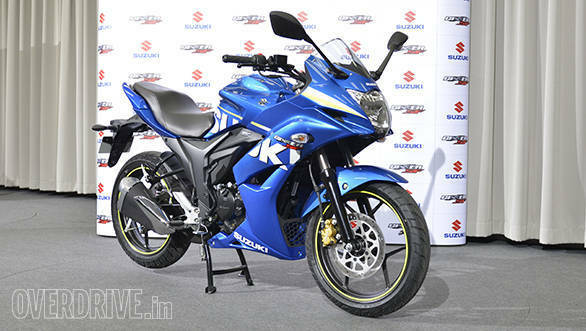 Suzuki has launched at a price of Rs 83,889 ex-showroom Delhi, which makes it Rs 11,690 more than the Suzuki Gixxer. Here's what is under the skin. 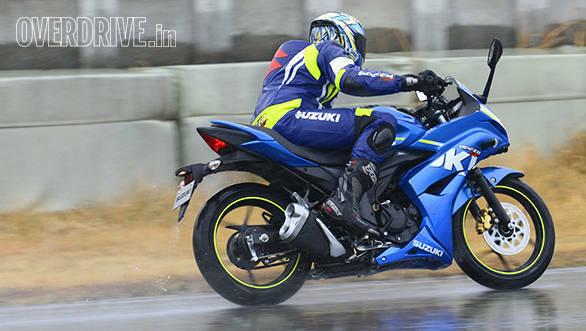 How is the Gixxer SF different from the Gixxer? The Suzuki Gixxer SF is essentially the Gixxer with the addition of that fairing. The only other addition to the frame is the hardware needed to mount the fairing. In that sense, you cannot take the fairing off and turn an SF into a Gixxer or vice-versa. Other changes include the top triple clamp and the tip of the unique exhaust, both of which are unique to the SF. So it's a cosmetic variant? Very interesting. 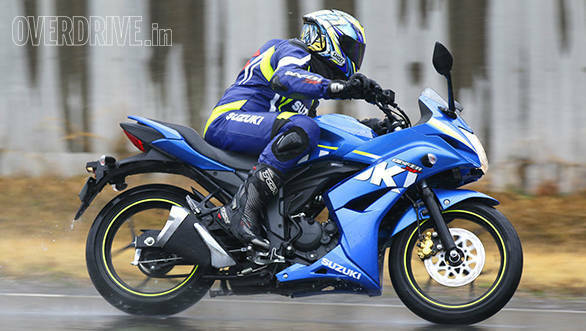 The Suzuki Gixxer was already a marvellous 150cc-class motorcycle and Suzuki makes some interesting choices to create another compelling alternative. You see, Suzuki as a manufacturer could have chosen to create a more focussed, vastly sportier motorcycle. But it hasn't. 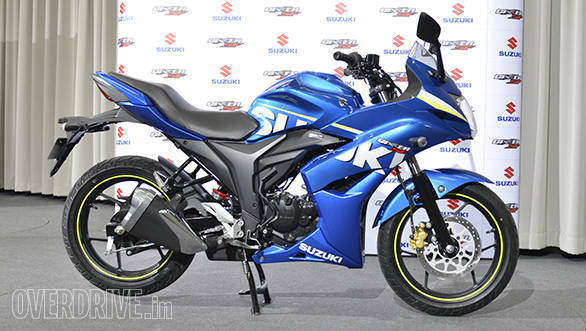 Suzuki has added that fairing but has not changed the rider ergonomics triangle much and you still sit sporty-upright. What that does is allow to crouch down if you like - that's how I got the bike to 130kmph down the straight. But when you're not in the mood - like when there's a slower rider in front of you - you're not riding a committed wrist-killer of a sportsbike. You can then choose to sit upright and ride normally. Calling it the best of both worlds would be hyperbole, but this is a good compromise between a fast, enthusiastic commuter and a responsive sportsbike. How was the test ride? The weather was some of the nastiest I've ridden a motorcycle in. Ryuyo is famous for being a super-windy place anyway and the day we rode the Gixxer SF, the weather closed in. It was maybe 3-5 degrees celsius, windy and it was raining. As we rode, the rain would get heavier. 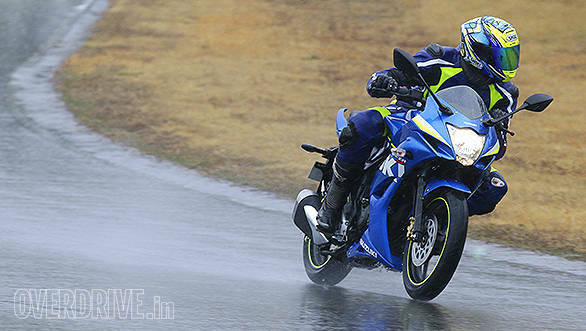 But the Gixxer SF reiterated why the Gixxer is so highly regarded as a motorcycle. Despite the cold, wet and slippery conditions (and various extremely cold and wet body parts), the SF was fun. The Suzuki lead rider upped the pace slowly as the day wore on and the SF never, ever felt out of its depth. It found grip in sopping wet conditions and the engine does its job with great zeal and refinement. It is a hard motorcycle not to like. The final turn of the track is a simple left hander but I realised that a big gust of wind pushes you to the outside of the track hard every single time. So every single time, the motorcycle would change its line but it is a such a good chassis that within a lap or two, the rightward link became a part of the process and I never worried about it again. 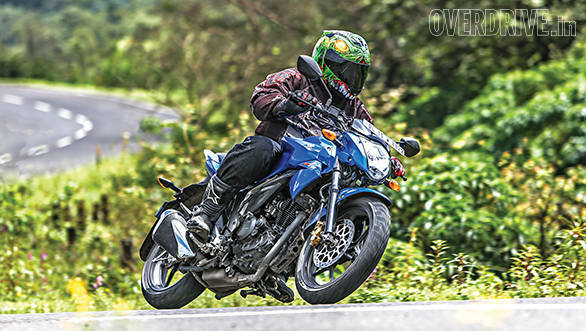 So should you buy a Gixxer or the Gixxer SF? Tough call. The difference between the two motorcycles is relatively small. Luckily, the difference in price is correspondingly small as well. So I'm going to say pick the one that suits your taste and budget more. In either case, you'll get the best 150cc motorcycle in our books right now. Why didn't Suzuki make it sportier? That's the only thing that troubles me about the Suzuki Gixxer SF. It didn't need to go into the same space as the Yamaha YZF-R15 version 2.0 for sure. However, I cannot help but feel that if Suzuki had given it sportier ergonomics, maybe sharper steering, it would have offered a uniquely inexpensive but very satisfying sportsbike to India. But it's hard to be too concerned about this because the SF does actually look and go rather well. No negative points at all eh? Hey, not fair. This is just a first ride. We know the bike goes well, both in the corners and down the straights. Suzuki haven't messed with the engine, so it'll be easy on the pocket as well. The price is reasonable too. So chances are the SF will have only a few negatives. Suzuki has been careful, and for instance, the fairing is made of many pieces of plastic so that when you drop the SF, fixing it should be relatively easy on the pocket as well. It does have the usual Gixxer niggles. For instance, that digital meter can appear to be dauntingly crammed full of stuff. But we know that it takes a bit of time but you get used to it. On the SF, you will notice that it sits in the usual ocean of black plastic and you have to wonder if there isn't a better solution to mounting small dashes on bikes like these. I also think that the Gixxer SF could have looked a little better from the front. Suzuki has retained the headlamp from the naked bike and I think it looks a little bit too narrow for the motorcycle overall. A slightly wider, more imposing unit might have worked better. But as I said, these are niggles and we've only just met the Suzuki Gixxer SF. Let's wait and see what the road test turns up.